Crowns can have a great cosmetic value; if your teeth have become chipped or worn down by heavy fillings, they can be an effective way to make your smile look fresh and attractive again. Even though they’ve been around for quite a while they’re still a mainstay of restorative dentistry. Crowns made from tooth coloured porcelain produce the best cosmetic effects. To make one we’ll take an impression of your tooth and send it to our dental technician. They’ll craft a beautifully accurate shape, and in the meantime you will be fitted with a temporary crown. Sometimes crowns are used for cosmetic reasons to cover misshapen or severely discoloured teeth. Whatever reason your dentist recommends a crown for, we have some excellent options to choose from. A CEREC machine allows your dentist to make a crown in a single visit using some amazing technology. Your existing teeth are scanned before a robotic milling machine transforms a block of ceramic into the perfect shape for your tooth. The results should look beautiful and there is no need for multiple appointments. Pure porcelain offers you the closest colour match possible to your other teeth while removing the possibility of any metal showing through over time. This makes them an excellent choice for front teeth in many cases. The defective filling and decay are removed. The restoration is created on the screen using image data. This is accomplished during a single appointment using Computer Aided Design and Manufacture. Polishing ensures a pleasantly smooth natural feel. Your permanent crown will be matched to fit the colour of your surrounding teeth and will be fitted with a special adhesive designed to make it last for up to 20 years with proper care. A crown can cover and support a tooth with a large filling when there isn’t enough tooth left, and can also be used to attach a bridge or protect a weak tooth from breaking. Crowns are also a really good solution for teeth that are discoloured or badly shaped, or after root-canal-treatment when teeth can become brittle as a result of losing nerves and blood supply. 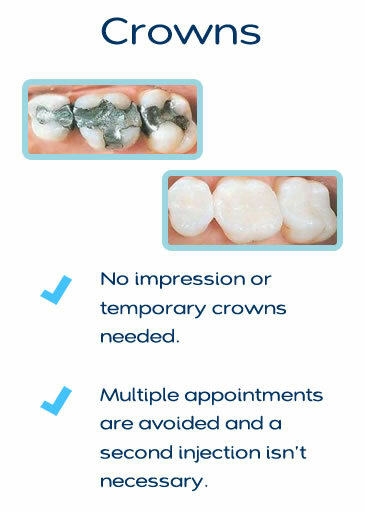 If you have damaged or painful teeth, book an appointment with us to discuss whether crowns might be the right choice for you. 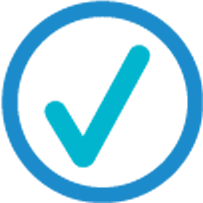 As with all treatments at our private dental practice, we’ll carefully assess your needs individually before deciding if crowns are the right solution. We’re passionate about providing dental work which is aesthetically pleasing as well as functional, so you can be sure that your crown will look right and sit naturally among your other teeth. Weakened teeth will receive sound, dependable protection as well as close colour-matching. The result will be a natural-looking smile and an enduring solution to what may have been a long-standing problem. I am delighted that I chose WeLoveTeeth. 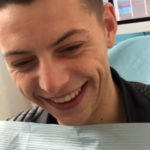 This is the best dental experience and results that I have ever had. My smile has been returned to me. A huge thank you Dr Brennan to you and your wonderful team.